I bought the Factory coat back in January, for only $91! I have been dying to wear it. Not the most ideal coat for winter in Chicago. I think the Factory trench is a great value for a classic wardrobe staple. I really like the pleated detail on the collar. Also, I would love a post on your classic wardrobe staples, maybe one for summer and one for winter. Enjoy your coat! A trench coat is essential for spring here in Chicago...I know I'll take a peek at J. Crew. Thank you! They both really do look great! I need a new trench in that color. I have a short black one but the tan ones are so classic - and much better for spring. Thanks for the tip! 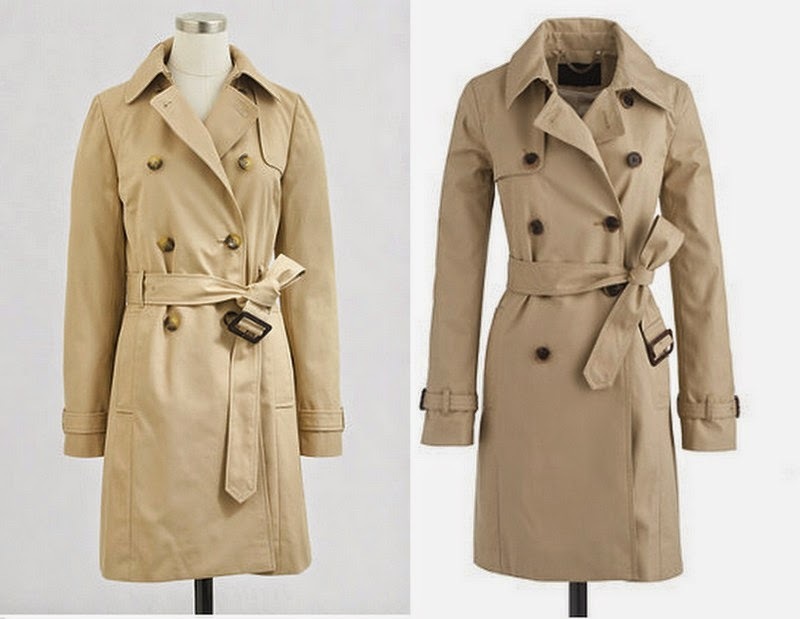 I love your thoughts on a classic trench coat. I currently have a black one that I wear very much during the transitional seasons. I have been considering purchasing a khaki version. Your notes and tips are much appreciated. The coat you chose suits you well! I have been hunting for the trench for so long! I will have to check these out! I think you made a great choice-- you look great in both but the Factory coat seemed to fit better; there looked like there was extra, unnecessary material in the second coat. I just love it when the better-priced option is the right choice! I am going to look for this coat too, I have a terrible time picking out coats and your post was so helpful. Thanks! Great choice, Tessa! 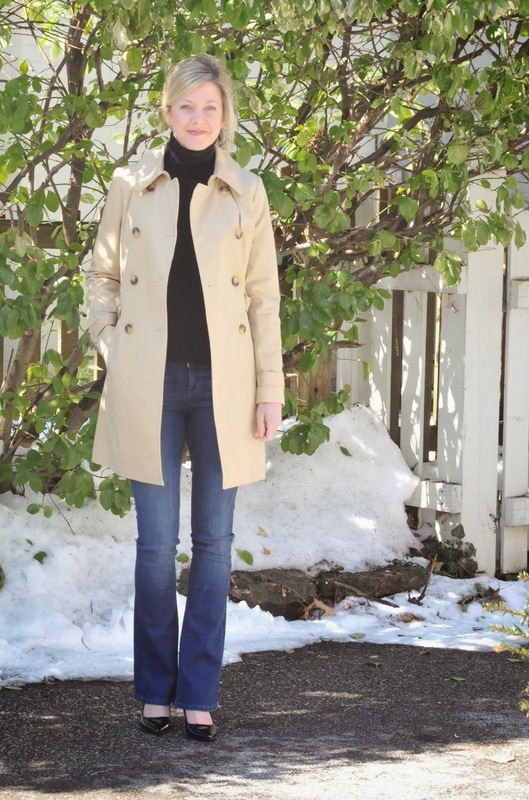 I have a trench from Banana Republic that I bought about 8 years ago and love. I'm only 5'1" and they carry petite sizes, which worked out nicely. 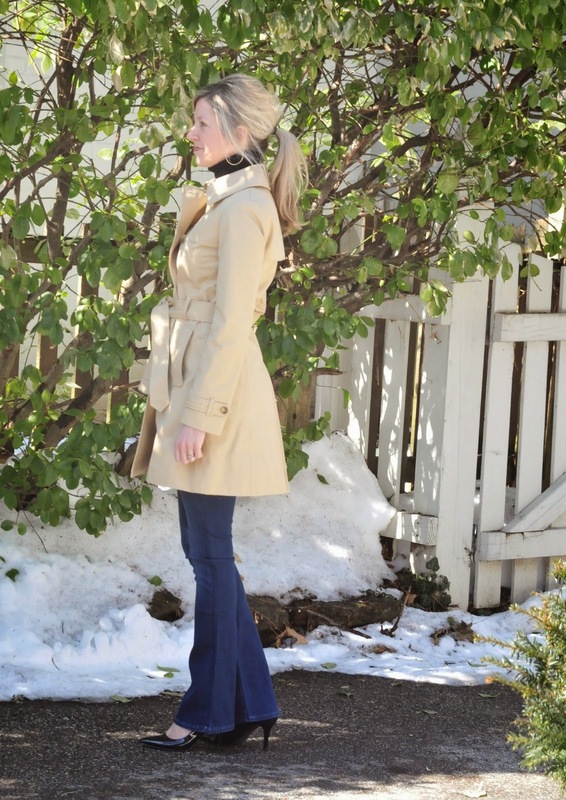 Love trench and love your new one!! I love a classic trench coat in khaki, but that color just doesn't look good on me. Therefore, I gravitate toward brightly colored trench coats. 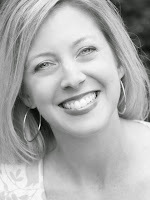 I recently purchased one by Donna Karan that is hot pink, a color I don't normally wear. It goes beautifully with my black, grey and brown outfits and adds that pop of color I crave on the greyest of rainy days. As a footnote to my previous comment, the trench coat I purchased is DKNY (not Donna Karan's high end line). It is the DKNY Buttoned Trench Coat in Pink Glow. It's water repellant and has a detachable hood. I love it. And when I wear that bright pink color, I notice a lot more people smile at me. It exudes happiness.